Why would I need self storage in Fort Worth, TX? There are a variety of reasons why you might need self-storage in Fort Worth, TX. How much is a storage unit in Fort Worth, TX? The cheapest storage unit in Fort Worth, TX is $16.00 per month. What size storage units do you have available in Fort Worth, TX? In Fort Worth, TX we have sizes that range from 4'x4' to 20'x30' to suit your storage needs. How much is it for a 4'x4' storage unit in Fort Worth, TX? The cheapest 4'x4' storage unit in Fort Worth, TX is $41.00 per month. Fort Worth is the fifth-largest city in Texas and one of the fastest-growing cities in the United States. Home to highly rated schools, restaurants and attractions, Fort Worth is a very desirable place to live. The city has a well-developed transportation infrastructure with public buses, carpooling programs and train services, making it easy to get around. Many of the main neighborhoods have been designed with pedestrians in mind and can be easily explored on foot. Originally founded in 1849 as an Army outpost, Fort Worth experienced tremendous growth when it was added as a stop on the historic Chisholm Trail. Eventually, it earned the nickname Cowtown, because it became a major hub of the ranching industry. Today, the city proudly represents its roots as a Western town, and many hints of its storied past can be seen throughout the area. The Fort Worth economy is active and diversified, fueled by a number of university communities and large corporations. The city's top employers include Lockheed Martin Aeronautics, the Fort Worth Independent School District and American Airlines. Manufacturing is one of the strongest industries in Fort Worth, but the government, transportation and utilities sectors are close behind. Because of its convenient location, Fort Worth is also a popular convention destination. This has contributed to a growing tourism industry, adding a variety of jobs to the local economy. If you're planning to join the Fort Worth job market, you can expect to find a range of both white- and blue-collar jobs. Sundance Square is one of the most expensive areas of Fort Worth, offering urban-style living that's gaining popularity among local professionals. From this neighborhood, you can enjoy a scenic view of Fort Worth's extensive skyline. The south side of Magnolia Avenue is an eclectic community, home to a diverse bunch of artists and creatives. Here, you'll find affordable, historic homes to restore, locally-owned cafes and a number of independent design firms. This is the city's hub of art, culture and music, home to major museums including the Modern Art Museum of Fort Worth. There are also many local music venues in the Cultural District, hosting a variety of country music and indie rock shows. 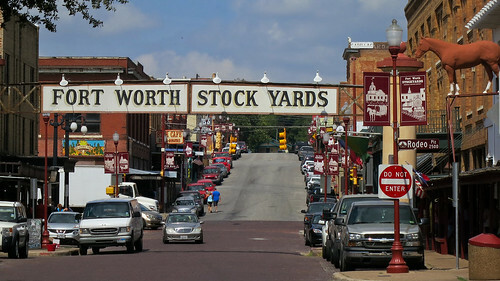 The Fort Worth Stockyards area offers the opportunity to step into the city's past, with brick walkways and wooden corrals that date back to its heyday as a leader in the ranching industry. Twice a day, a cattle drive takes place through the neighborhood's main street, just as it would have over a century ago. The Fort Worth Independent School District manages a majority of public schools in Fort Worth. The area is also home to a handful of K-12 state charter schools, as well as a number of private schools. If you're planning to attend college in Fort Worth, there is a range of options to choose from. Texas Christian University, the University of Texas at Arlington (downtown Fort Worth campus) and Texas Wesleyan University are among the largest in the city. Utilities: According to Texas law, you'll have the freedom to choose your electricity provider from a variety of options. Water and sewer services are managed by the city of Fort Worth. Garbage and Recycling: The city provides regular collection of trash, recyclables and yard waste. Transportation: Public transit options include an extensive network of bus routes in and around the city. There's also a bike-sharing program, providing convenient access to rental bikes in several parts of the city. With housing from charming lakeside cottages to modern, urban lofts, Fort Worth is home to a range of neighborhoods and districts that can cater to all tastes and budgets. Our lowest priced units in Fort Worth, TX average $36.65 per month. 1724 people have reserved units in Fort Worth, TX in the past 30 days. There are 34 locations within Fort Worth, TX's city limits. There are 19 locations in Fort Worth, TX that offer AC and Heating features.